Junior Ace Program lessons at the 96th Street Red Clay Courts in Riverside Park. Mondays at 5pm to 7pm (two-hour class) for six weeks. Groups of 4 players per coach. 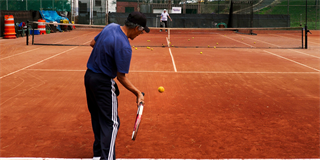 This program is for intermediate to advanced players, with a serious interest in improving and competing in tennis. Emphasis is on match play, movement, tennis skills development and basic tactics. Runs April 29th to early June. This group is for players with some experience (3.0-3.5 rating range). Emphasis will be on hitting a lot of balls during the hour in order to improve basic strokes and develop consistency. 6-week course on Mondays at 7pm, starting April 29th. 6 players per class. One hour. Junior Ace Program lessons at the 96th Street Red Clay Courts in Riverside Park. Tuesdays at 5pm to 7pm (two-hour class) for six weeks. Groups of 4 players per coach. This program is for intermediate to advanced players, with a serious interest in improving and competing in tennis. Emphasis is on match play, movement, tennis skills development and basic tactics. Runs April 30th to early June. This group is for players with some experience (3.5-4.0 rating range). Emphasis will be on hitting a lot of balls during the hour in order to improve basic strokes and develop consistency and power. Play points and games. 6-week course on Tuessdays at 7pm, starting April 30th. 4 players per class. One hour.